Home sweet home, right from the entry. This corner changes with each season, with each new sprout that emerges in the big planter, with every this or that left on the table, or hanging from a nail. 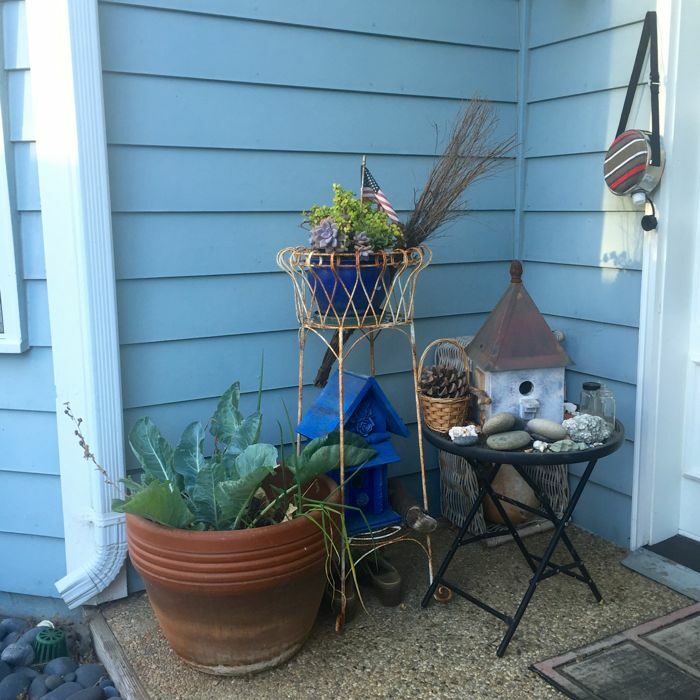 When I come home I see familiar things, like bird houses, and beach stones, seashells, and the onion tops that grew again, and I feel a sigh of bliss, because this is our Bird House, and those are our onions, our treasures and bric-a-brac. It's almost seven years since the Big Blue House became our own Bird House. Seven years settling in, making a home, trusting, learning, enjoying. I wish everyone, who desires it, could have their own corner to call home. A lovely corner of your home!